After all the recent extreme weather it may surprise you that Spring has actually sprung! Your children are always growing and changing much like the season so it’s important to take advantage of every opportunity that Spring offers to educate and bond with your children. 1. Talk about the weather! 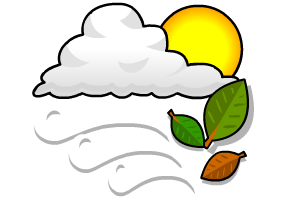 One of the main things that signifies a change in season is a change in the weather – always a hot topic in the UK! What a perfect excuse for children to create their own weather report! And a fun way to develop their literacy and geography skills to boot. Have them pick a country on a world map and discuss with them what they think the weather will be like there – you could talk to them about the hemispheres (great for vocabularly!) and which areas of the world are hottest, and which areas are coldest. There’s a weather report project in Busy Things perfect for your budding meteorologists! 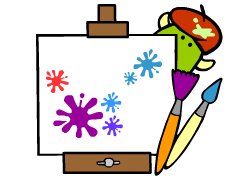 In contrast to the cold and colorless winter, Spring is a time of great vibrancy, and a great time for crafts with kids. The plants and animals are all full of colour so set your children to work – drawing, colouring, and painting nature. Also, have your children mix their own paints. Let them explore and experiment with the medium. If you wish, you can teach them the basics, such as the primary and secondary colours, and how to mix certain colours. Otherwise, you can let them run amok with the paint. They’ll find themselves fascinated by all the tones and shades they can create! Why not use natures painting tools? Sticks make great paintbrushes, whilst leaves and flowers are fabulous stamps. 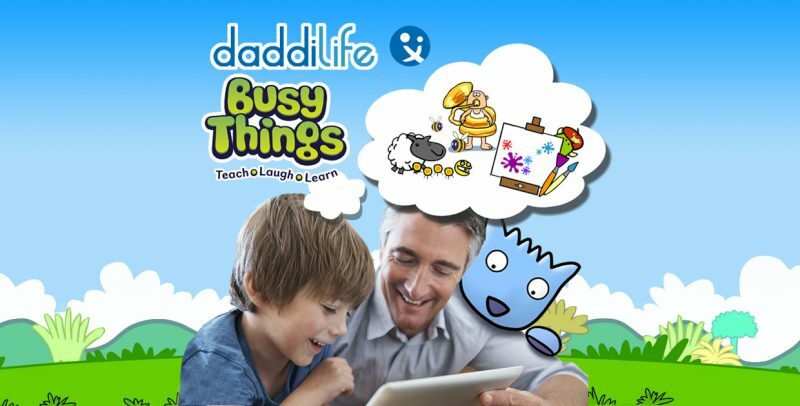 Busy Things’ own ‘Busy Paint’ programme means they’ll find no shortage of things to draw and paint online either, and you’ll have enough artwork of flowers, birds, and insects to turn your house into a gallery! 3. Nature is a mathematical playground! With the warmer weather on the way there’s no excuse not to get out and about which gives you endless possibilities for learning. Nature is full of shapes and patterns – how many circles, triangles and rectangles can your children spot or collect? Get gardening! Give your little ones green fingers and use the opportunity to discuss a few simple calculations – having planted 2 bulbs, how many more do we need to plant to make a patch of 5 bulbs? Get the chalk out and play hopscotch – this classic game is great for number recognition. Have your children practice counting different flowers or animals. Along with helping them improve their arithmetic skills, it’ll help their classification skills. If it’s more of an indoorsy day there are a large variety of online arithmetic games that can make learning maths fun and interactive. 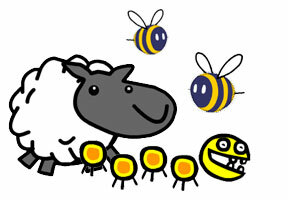 One of our favourites from Busy Things is the spring themed game “Hungry Chicks“. 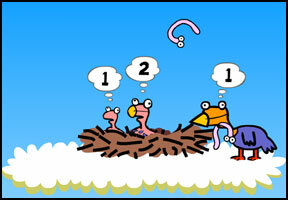 In this calculating game, children must help a mother bird feed its chicks the correct number of worms. The benefits of music and movement in child development have been well documented so get ready to sing, dance and act silly! Rendition of Old McDonald anyone? What different sounds can they make around the garden or the park? 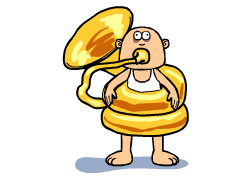 “Musical Garden” is a brilliant game, available on Busy Things. A simple open game for exploration and experimentation. Children are presented with a variety of flora and fauna, and can click them to make musical noises. Your children will become enthralled with the game, and you will be excited to see what beats and melodies they may create. 5. Spring brings baby animals! One of our favourite things about Spring is the arrival of baby animals! A visit to a farm at this time of year is a something for the whole family to enjoy and a lovely bonding experience. If you have a Tuff Spot why not recreate the farm on your return! You can talk to your children about animal lifecycles – frogs, butterflies and chickens are perhaps the easiest and most fun to explain…. Butterflies: Read or watch The Very Hungry Caterpillar and go on a caterpillar hunt. Frogs: Frogspawn is everywhere at the moment, fascinating stuff! Make sure you head down to a lake when the frogs hatch, the kids will love seeing them. Chickens: You probably have some eggs in your fridge, and can explain to them how they come to be, and what happens when they hatch. And everybody knows the “Chick Chick Chick Chicken, lay a little egg for me” song! Busy Things of course has a selection of worksheets available for children to write about and illustrate animal life cycles, prompting discussion e.g. for The frog lifecycle.